Blog Quick Quotes: CHA Sneak: Summer Samba Day 4! CHA Sneak: Summer Samba Day 4! The Summer Samba CHA Sneaks continue! "Here Comes the Sun, and I say it's Alright!" Happy Saturday! Today, Julie and Rhonda are hosting the blog. 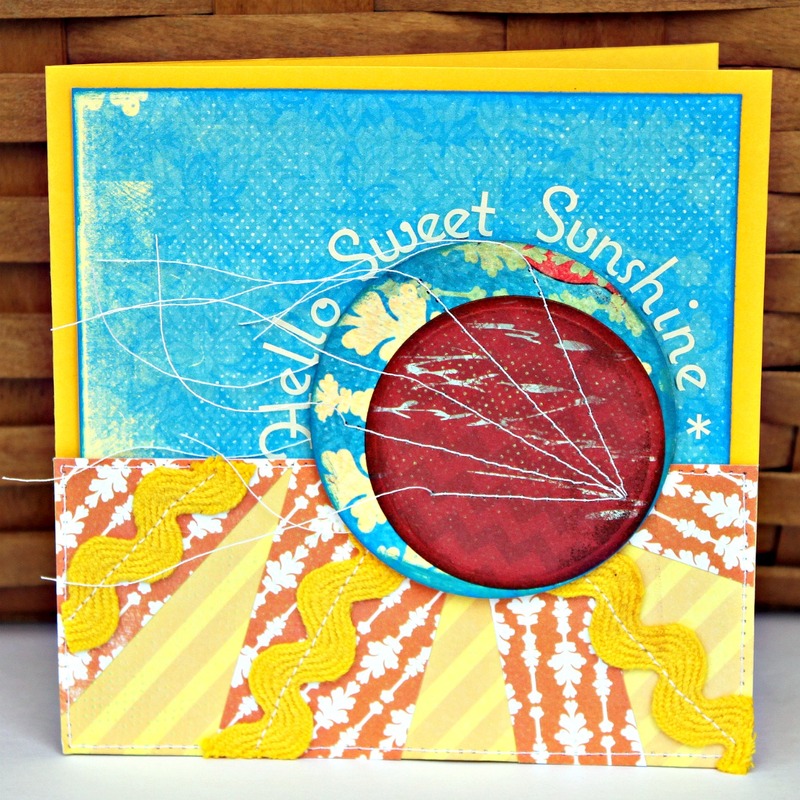 Up first is Julie with an adorable layout she created using this charming new line!!! Do these papers make you feel just a little bit warm and cheerful? It just makes us smile, we all agree working with this line is a happy maker! I am back again with a creation from Quick Quotes new Summer Samba collection. This is a collection full of fun bright colors! It was perfect for this photo of my daughter hamming it up in the pool. The vellum was perfect to use along with the journaling spot for my title. Don't those banners add the perfect extra touch? I just LOVE this new collection. It is absolutely perfect for those summer and vacation photos. 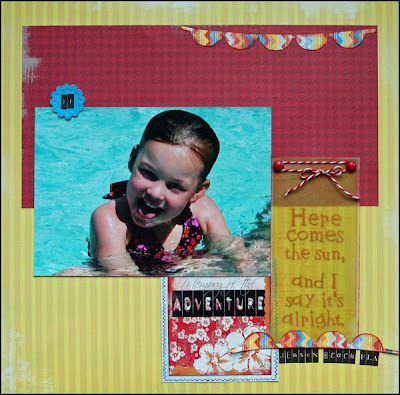 I used Spellbinder's Creative Page Tab die to put the year of the vacation. I love these page tab dies. They are so unique in the fact that they not only cut, but emboss too. For my tag I cut and embossed. Love how versatile they are. Greetings to you from Rhonda! There's a little story about my card for today. I intended on creating this for submission to the recent Paper Crafts call for their sketch. Due to family illness, this did not get done in the timeframe required for the submission. So, I thought it would be fun to share it. 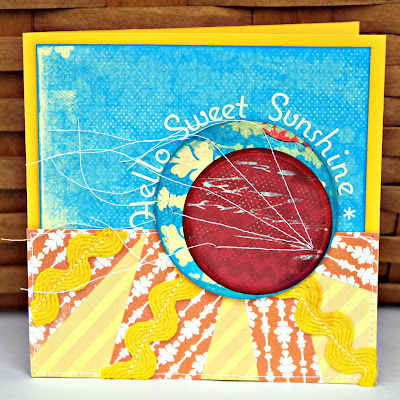 I used my Spellbinders Grand Calibur and the circle dies to create my sun shape. Thanks for stopping on over! Have a super fabulous weekend!!! Be sure to stop back over tomorrow for the winner of the all new DreamScape line! Reminder! Only one more sleep until our Design Team Call closes at midnight!!! I love the bright colors..a breath of fresh air for this snowy white time of year! I am really loving the projects I have seen using Summer Samba. Love the bright vibrant colors. The layout and card today are fabulous! love the papers and the projects are amazing! Lovin' all of this summery inspiration and great new colors this week! Especially like the use of the rickrack for the sun's rays. Julie very cute layout. Love the little banner and the vellum quote is so perfect. Rhonda I love the rays of the sun and the use of rick rack. Also loved you sewed on card. Something I want to do more of. Great job ladies. Wow, the colors in Summer Samba are so great. They just evoke summer, sunshine and fun. Great layouts. It's wonderful. Nice job ladies. Can't wait to see what's next. Loving that card. The combination of papers and ric rac is fantastic!!! I love all of these fun projects that have been made using this line! It is so bright and fun! Great projects, I can not wait to get the Summer Samba collection, beautiful!!!! Julie, if your little girl gets any cuter, you're going to have to lock her away in a tower until she's about 30! LOL! Love the layout and the Summer Samba papers are perfect to go with this adorable pool photo. Rhonda, your card is awesome too! I love the sort of abstract feeling of it yet the sentiment says it all. There's no mistaking that sun and it's pretty summer rays. The stitching is a really cool finishing touch to your overall design. I love both of these projects... but then it's rare that I don't like what you ladies create. What a fun LO, and great pic too! I also love the circles on the card and how they are lined up! Thank you so much for such wonderful sneak peeks! Great projects! Such a fun line! Great designs and such great looking paper! I'm just going to have to pick that up!